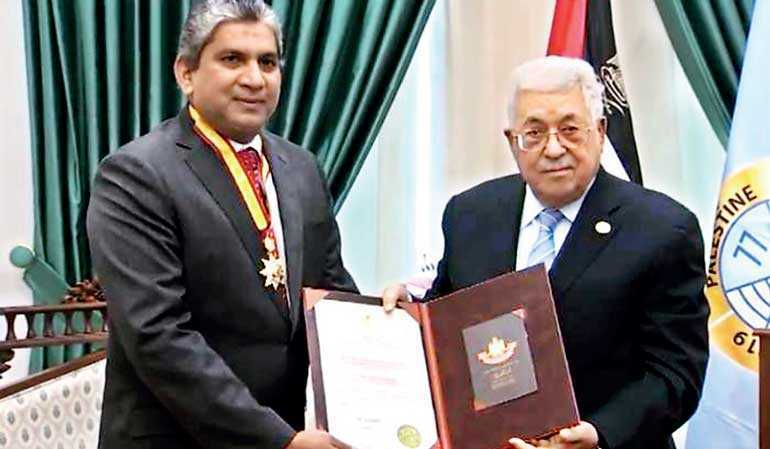 President of the State of Palestine Mahmoud Abbas awarded the Star of Friendship (President Mahmoud Abbas Gold Medal) to Mohammed Fawzan Anver the Ambassador of the Democratic Socialist Republic of Sri Lanka. This was during a farewell meeting organised and held at the presidential headquarter in the city of Ramallah, as Mohammed Fawzan Anver has completed his tenure as an Ambassador of Sri Lanka in the Palestinian territories, in the presence of the Minister of Foreign Affairs Dr. Riyad Al Malki and Majdi Al Khalidi, the Special Advisor of the Diplomatic Affairs for the President. 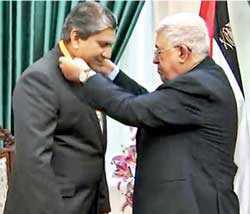 The Ambassador of Sri Lanka was granted the Star of Friendship (Gold Medal of President Mahmoud Abbas) in recognition of his outstanding role in strengthening excellent relations between Palestine and Sri Lanka, and in appreciation for his efforts in supporting the Palestinian people and supporting their just cause to get their freedom and independence. During the meeting, President Mahmoud Abbas thanked President Maithripala Sirisena and the Government of Sri Lanka for granting a plot of land and a building for the Embassy of the State of Palestine. President Mahmoud Abbas also thanked Sri Lankan President Maithripala Sirisena for addressing the 73rd session of the United Nations General Assembly last year in New York as it was a big support for the Palestinians and their just cause. The President of Palestine also thanked Ambassador Anver for a number of political and economic achievements he made during the tenure of service; starting from holding the first round of the political consultations between the Palestinian Legislative Council and Sri Lanka Parliamentary Delegation held in Palestine in 2016. Sri Lanka Delegation was headed by Dr. Rajitha Senaratne. First political consultations between the Foreign Ministries of Sri Lanka and Palestine were held in Colombo in 2017. Palestinian side was led by Dr. Mazen M.A. Shamiyah, Asst. Minister for Asia, Africa of the Ministry of Foreign Affairs of Palestine and Sri Lanka Delegation was led by Grace Asirwatham, Addl. Secretary of the Ministry of Foreign Affairs of Sri Lanka. The President also appreciated, that after assuming his duty he encouraged tourism between the two countries, pointing to the visit of approximately 22,000 pilgrims, from Sri Lanka to holy places such as Al-Aqsa Mosque and Nativity Church in Bethlehem, Palestine in 2018. President Mahmoud Abbas said he is very proud that Palestinians have invested on tea trade in Sri Lanka and also that they are one of the top 10 tea exporters in Sri Lanka. And another Palestinian businessman also invested in a housing project in Dehiwala. He also added that ‘Ceylon Tea’ is very popular in Palestine. Therefore, all Palestinians are consuming Ceylon tea. President Abbas thanked his counterpart for the invitation given as a special guest to a Palestinian Sheikh Attallah Naser, Reciter of the Holy Quran at Al-Aqsa Mosque (Quari) to conduct prayers at the President Iftar function held at the President’s Palace in Colombo and he also thanked Fawzan Anver the Ambassador for his efforts in arranging this visit. President Mahmoud Abbas discussed the matter of the memorandums of understanding which have been agreed upon between both countries, such as the joint business, and the joint cooperation agreements, also the agreements of cooperation in the fields of agriculture, health, security, culture, arts, and higher education. The President also appreciated the organising of Burdha Shareef on the Mihraj Day in Kubbath al Sakhra Masjid, Al Aqsa, Jerusalem, for the past three consecutive years. On the final note Anver thanked the President for his farewell function and requested him to visit Sri Lanka to open the Palestine Embassy at the opening ceremony.